The design of this Swivel Counter Stool takes an oval lattice work and frames it within a header back, giving this stool a very classy look. Add its padded seat and swivel and you have both the look and comfort you deserve. This stool is also available in a Bar Height. The 1133 Swivel Counter Stool by Homelegance at AHFA in the area. Product availability may vary. Contact us for the most current availability on this product. Finish Dark Cherry Finish on Hardwood. 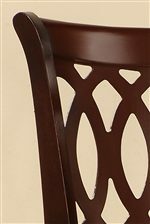 The 1133 collection features a dark cherry finish that will bring a touch of class to any home. The 1133 collection is a great option if you are looking for Contemporary Traditional furniture in the area.